Michael Vanderhorst has always been a lone wolf. Or lone vampire? Whatever. Point is, this ancient gentleman vampire is obsessed. She&apos;s quirky, a horrible dresser, and the cutest librarian he&apos;s ever seen. The question is, why her? In four hundred years, no one has ever captured his attention like this. He must find out, which is why he just signed on as her new assistant. The problem is, she has no idea vampires exist or that she&apos;s just broken one of their laws. As the leader of his territory, Michael has been ordered by his council to turn her or kill her. "Over my dead body!" To overturn the ruling, Michael needs the council on his side, and right now they&apos;re asking him to hunt down and execute five hundred vampires no one can seem to locate. Unfortunately, his assassin days are long over, and he&apos;s not so sure he can go back to killing. But with Miriam&apos;s life on the line and their unusual bond growing stronger each day, will he dust off the old sword or give her the bite that will make her his forever? 5.0 out of 5 starsLight hearted vampire mystery. I very much enjoyed this book. 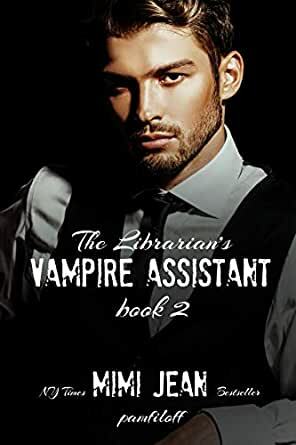 I love the quirky take on things and that it's not so much a vampire romance as a vampire mystery with a touch of romance thrown in. I can't wait for book 3. These books are getting so good...still hope that Michael and Miriam get their happily-ever-after, like a good Anne Rice book. If this doesn't happen, I may have to pull a Mr Nice and hunt down the author (evil laugh). What I really love about this new series is you get a main mystery that is solved in the duration of the book before a new one is given to you al la cliff hanger. You also get smaller questions which may or may not be answered in the same book just to keep you hungry for more. I can’t wait to see where this series goes. You could read this as a stand alone but everything will make way more sense if read in order.